When the mountains call, it's time for the Nordwand Light HS Hooded Jacket Men. The jacket is made from a new 3-layer Gore-Tex® Active material with Gore® C-Knit™ lining technology, giving it lasting windproofing, breathability and waterproofing. It is therefore ideal for activities in changeable weather conditions. The Mammut® High Reach Technology™ brings you unrestricted freedom of movement, while the Mammut® Vertical Motion Technology™ optimizes the jacket's ergonomics in alpine movement sequences. 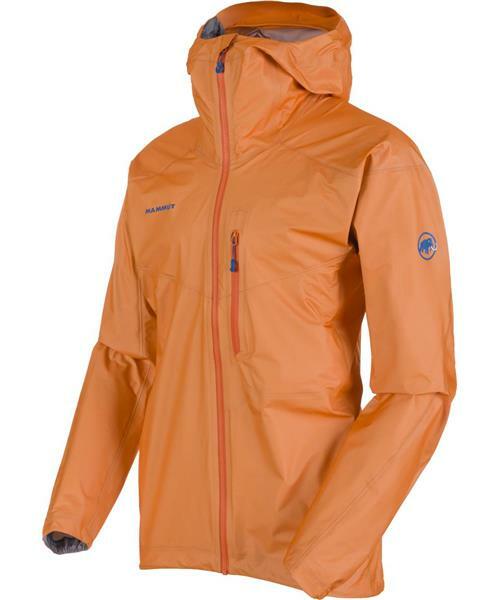 The hood features the Mammut Single Pull Hood™ system and is both stormproof and helmet-compatible. It also has a reinforced visor and can be adjusted vertically and horizontally with a single pull. Flat seams make the jacket feel comfortable to wear and avoid chafing under a backpack. To maintain maximum flexibility when climbing, the jacket has very narrow seams with 8 mm Gore-Seam® tape for a light weight and small packing volume. Ideally suited for the mountains.